I'm just curious as to something I've briefly been by the [Toronto Archery] range and looked at the signs and was very happy I didn't see any signs about no crossbows but after reading tour sight I have noticed that you have them prohibited as well. I was just curious as to weather this is new or if I just missed it when reading. And if you might be able to recommend a club in Toronto that does allow them due to the fact that I cant find archery ranges that do and am in no way interested in going to a gun range that does. 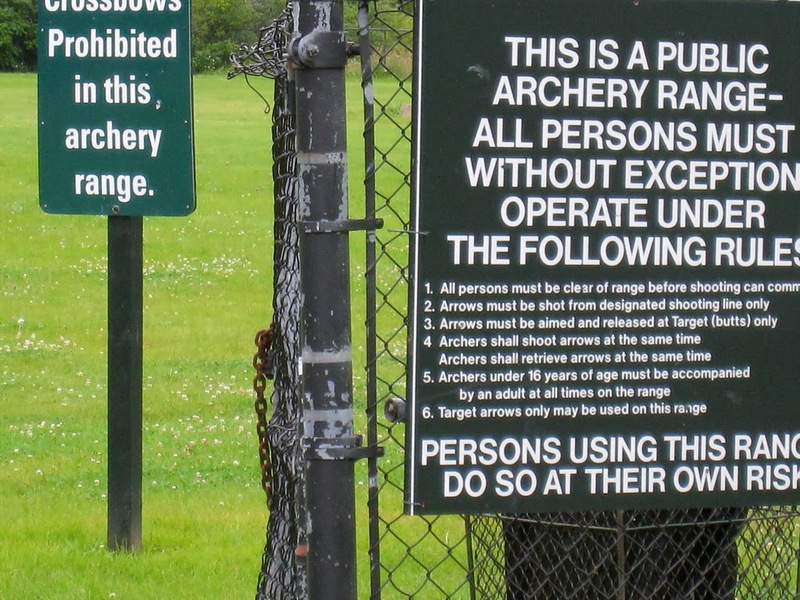 There are large crossbows prohibited signs near both entrances of the Toronto Public Archery Range, near the rules of the range signs. I have a crossbow too so what I do is shoot it in the garage and take it with me when I visit relatives in the countryside so I can practice at their farm or cabin. I am currently working on building my 2nd crossbow, improving on the designs of my 1st, so it will be fun to see how much more powerful and accurate it is. Then there is also the matter that a typical crossbow bolt would go right through the targets at the archery range. The material is too soft to slow them down efficiently. With respect to gun ranges, I agree. I would not be taking my crossbows to a gun range - for a variety reasons. If you have a garage, I would say use it. If you don't there are several private archery ranges outside the city limits which allow crossbows. Failing that if you have relatives that own farmland or a cabin, that would be a great option. I have also heard of people practicing in abandoned quarries, old garbage dumps, side roads that aren't serviced in the winter - basically anywhere off the beaten track where you couldn't accidentally hurt anyone. That may seem like ridiculous safety practices, but if you're packing a crossbow with say 180 lbs - that is enough to kill a bull elephant - you would want to treat it like a loaded firearm that could accidentally fire at any time once it has been loaded. If you do hear of any crossbow clubs or private ranges within Toronto let me know, I would like to join. Well I've gotten almost the same answer from every archery range I've messaged asking if the knew any place... I think my next step here is looking in to regulations and by-laws and seeing if any buildings in the area that will rent space from time to time or on a regular basis cuz every person I've talked to is also interested in finding a place. I know there is a thirst for an indoor archery range - and if it allowed bows, crossbows and airsoft it would have a long list of people looking to use the place. The trick is price. Most archery ranges charge people $10 per hour to use their facilities. I am not sure if you are thinking in that direction, but its an option if you are willing to take a risk. All you would really need a commercial basement that is for rent that is long and narrow - and cheap. With effort you could probably find a place that is even cheaper / more affordable. You could even buy a scrap of vacant land up north, tiny but affordable. There are lots of scraps of land up north that people cannot build on for whatever reason (eg. too rocky), but would be great for a crossbow range. Thank you very much for the vote of confidence and I have already put in an email to Rob Ford's office to have them send me anything pertaining to the regs and laws surrounding it in Toronto. And a place like what you sent would be perfect. I am hopping there isnt as much red tape as I'm expecting so that can be used a club with limited membership rather than a contantly supervised range. Yeah, I suppose if you found 9 other people willing to pay equal shares you could get it down to $80 + HST per month for renting such a place. Thus it would be a limited club that is only open to club members and their guests. Heres hoping... now I just have to figure out what the city has to say about it. I would contact the Toronto police non emergency number (416-808-2222) and ask if they have advice on the topic, what regulations would apply, etc. They might have a better idea than City Hall - who I hear are too busy with scandal after scandal to get any real work done. NOTE - This conversation is ongoing and will likely get updated later, subscribe to this blog if you want to learn more about a possible Private Indoor Crossbow Club in Toronto.